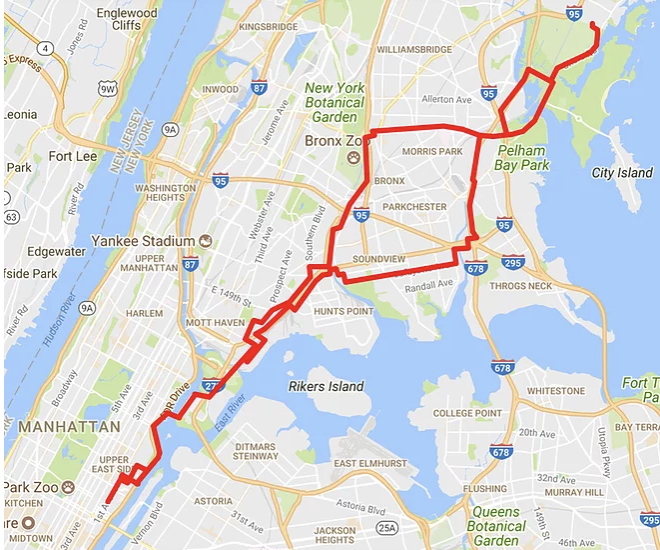 Take a fun ride toward City Island the Bronx, riding on some of the best hidden greenways NYC has to offer. Trying to find these greenways isn’t always easy since there is no signage, but your tour guide takes you in the right direction and shows you the way. We ride up to Pelham Manor in Westchester Country via the Bronx Greenway system. It takes 20 minutes riding on local streets to get to these greenways, or you can choose to ride on the ferry that brings us close to them. The optional ferry ride would take us to/from the Soundview section in the Bronx and would bypass most of the local streets. The only negative is that we would miss the Randall’s Island Greenway. You can always choose to ride the ferry one way and ride the bike one way, ride the ferry both ways, or ride the bike both ways.